Ever been on an awkward first date? Of course you have! It happens to all of us. The combination of anticipation, expectation, nervousness and trying to make a good first impression is a recipe for disaster at times, especially in these days of dating apps and Tinder, when reality meets a carefully curated online persona with a crash. 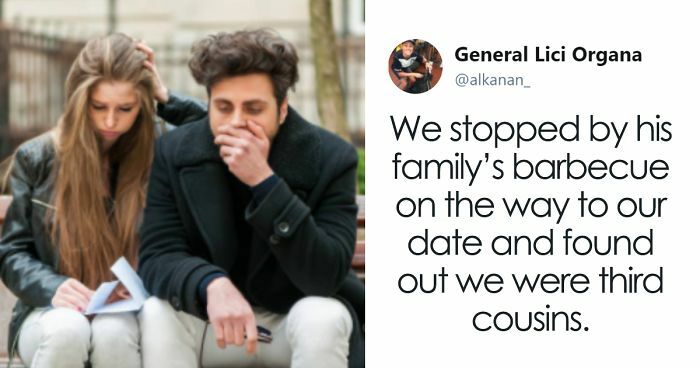 We here at Bored Panda have rounded up some of the funniest and most cringeworthy tweets under the #worstfirstdate hashtag, kicked off by Jimmy Fallon as part of his legendary hashtag challenges. It’s enough to make you want skip the dates and stay at home! Scroll down below to check them out, and if you just can’t get enough we have more from a previous post here. OMG! If he didn't see you for the gem you are, he wasn't worth it. Thank god you find out now!!! Two's a couple, three's a crowd. He could be bi-, don't see what the big deal is. They had a date, not a lifetime commitment. Waiter should have taken a hint and not be rude. That's honestly more depressing than embarrassing. By any chance, will I find there his side of this story too? That's like that car commercial! how did you end up at his ex wife’s in the first place? Not enough! Tell us more! You can still be an independent woman and let a guy be a gentleman. Did he take care of you? If yes, he is definitely a guy you should see again. I think he was looking for a mom, not a date. I guess you've had a date with 3 kids. I talk to my NSA agent all the time. He doesn’t talk back much though. .............. how do you elbow someone in the face when you're trying to kiss them????????? Quickly spit on your fries! Let's see if he eats em now! i mean, spending $2000 at a walgreens in half an hour seems like kind of an impressive accomplishment. Well, at least she knows you think that the place she works at is date-worthy! Just how long were you getting ready if he could eat dinner during this time? You got away...that’s the main thing. ......What!? Why would any one do that? You married her so you were going to be wrong all the rest of your life ? Ok, I have nothing against vegans, but trying to make other people vegan is just not ok.
That's actually quite sweet, especially that you went along with it. Obnoxious, is you capitalizing each single damn work on that post. There's no way I'd be walking in a 'dark, hilly, empty field with someone I know, never mind stranger and not seeing deer might have been the least of your problems..
And this is a bad thing because...? Omg the guy from ghost hunters! Ok... I scrolled past the first one, but is no one going to admit that they are bothered by seeing it called a 'convenient store'?? Ugh! Why do people do that. Call for the check. Say have a good night. The extra 10 minutes won't kill you. Time to give him a list of reasons he can read tomorrow as to why he woke up in a dumpster. a peen! omg thats great! Umm... the emergency exit was locked? You could have stopped kissing him. "I went on a date with a guy from tinder..."
Convenience store buffet? Like All-You-Can-Eat-Hotdogs off the roller thingie?